You smell a foul odor, look around for the culprit and disappointedly find out that your home is experiencing sewer line damage. Who do you call? Level Pro Foundation Repair Inc., of course! Our experts specialize in Stafford-wide plumbing, installation and slab sewer line repair services. All of our plumbing specialists are also licensed, bonded and insured for your home’s safety and peace of mind. Our plumbers take part in extensive and ongoing training to ensure that we send only the most well-trained plumbers to your home. We use diagnostic plumbing testing and video camera inspection of sanitary sewer systems to accurately identify any slab sewer line problems. Our hydrostatic pressure test can quickly indicate any leaking sewer pipes beneath the slab. Sewer drain leaking can be an expensive problem if not treated immediately. Calcification, ground movement, root intrusion and line aging can all cause sewer lines to leak, back up or end up in complete failure. These leaking sewer pipes can also cause thousands of dollars in foundation problems. In addition, the mold and bacteria contamination from damaged sewage systems can create significant health risks. There is also the possibility of plants invading residential sewer lines. Plants like the organic material in sewer pipes. Once they get a taste, they can be a huge nuisance. How can you tell if you need slab line sewer repair? All healthy homes need clean water and the ability to drain out contaminated water. Copper is a common material used for tubing material. While copper does resist initial corrosion, they can leak, burst and corrode over time. 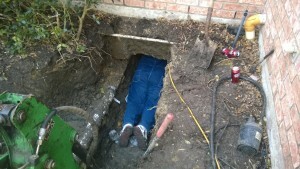 Our slab sewer line repair services ensures you never have to endure this torment for much longer. Aging and deteriorated sewer system replacement and relining is our specialty. No leak is too deep for our team. 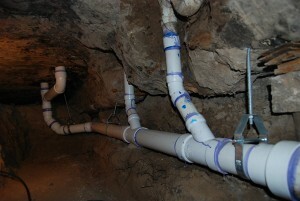 We can hand-dig tunnels to fix PVC pipe leaks, hot water slab leaks and foundation leaks as needed. Even when your new pipes pass all testing, they are protected with our warranties. The process is completed in a matter of days, meaning you can get back to living your life without any intrusions or worries. Plus, we won’t destroy your plants while working on your property. 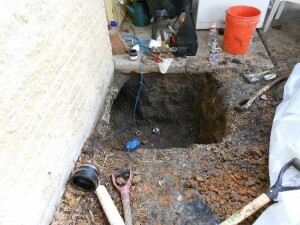 Call Level Pro Foundation Repair Inc., for slab sewer line repair or foundation repair today.